The Lorax on DVD, brought to you by one of the greatest children Authors of all time, Dr. Seuss! 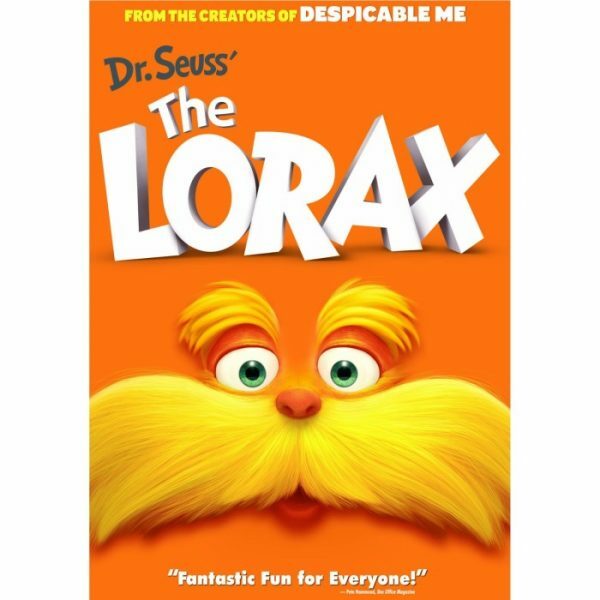 An animated rendition of Dr. Seuss’s classic book about the threat of industrialization to nature, The Lorax opens in Thneedville–a town never depicted in the original book. Thneedville is an artificial place, made primarily from plastic. It sports inflatable trees, fast cars, and air quality so poor that the residents are forced to purchase bottled fresh air. In another new twist to the story, 12-year-old Ted (Zac Efron) discovers that his crush Audrey (Taylor Swift) wants nothing more than to see a long-extinct Truffula Tree, so he sets out to impress her by finding one. Since there are no real trees in Thneedville, Ted acts on the crazy stories of his grandmother (Betty White), venturing beyond the city’s walls into the desolate wasteland to locate a mysterious creature called the Once-ler (Ed Helms). Here the story and animation begin to more closely follow the book. Ted discovers the grumpy recluse, who reluctantly begins to tell him a tale about a once-perfect landscape filled with beautiful Truffula Trees and cute frolicking animals–a landscape now decimated by one greedy young man’s insatiable appetite for profit. The beauty and wonder of the Truffula forest and its creatures are right out of Dr. Seuss’s illustrations. While the forest creatures may not be directly referred to as Brown Bar-ba-loots, Swomee-Swans, and Humming-Fish, the cute little bears, funny-looking ducks, and especially charming trio of singing fish are instantly recognizable. They serve, as they do in Dr. Seuss’s book, to add just the right amount of humor and levity to what would otherwise be a pretty heavy-handed message from the Lorax (Danny DeVito) about environmental preservation. Ted’s hormonal instincts to impress Audrey slowly begin to take a back seat to the plight of the lost trees and animals, and the Once-ler’s assertion that “Unless someone like you cares a whole awful lot, nothing is going to get better” rings true by the end of the film. The abundance of original music is a nice and unexpected addition to the story, though why neither Efron nor Swift actually gets to sing is perplexing. Dr. Seuss’ The Lorax is on sale now!